If you have pain or limitation from this condition and live in Greenville-Spartanburg SC, then call the rehab experts at Purposed Physical Therapy, Greenville SC at (864) 881-1712! Like, comment, follow, tag, and share if you have, or you know someone who has, this condition or pain. Welcome to Purposed Physical Therapy’s resource on calf strains. That sudden pull in your lower leg from walking, running or jumping is quite a common problem. 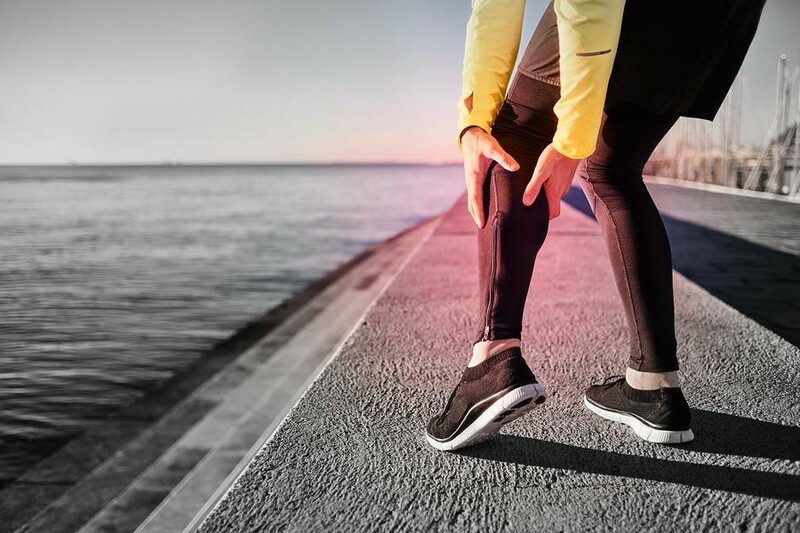 Depending on how badly you have injured your calf, a calf strain can either be a little nagging pain while you walk, or can take you fully out of your regular activity and require you to walk with crutches! The calf is an area of the body that most people know as the area that works hard to lift you up onto your toes and help you jump. Few people are aware, however, that there is more than one muscle creating the bulge of the calf area. The large muscle that makes up the bulk of the calf muscle, and the one that most people are aware of, is called the gastrocnemius muscle. This muscle spans from the back of your heel on one end (the Achilles tendon) to the lower end of your thighbone on the other end. Since this muscle crosses both at the ankle joint and at the knee joint, it has functions for both these joints. The gastrocnemius muscle points the ankle downward, or in medical terms, plantar-flexes the ankle. This action is used to raise you up onto your tippy toes and to push yourself up as you jump. The gastrocnemius’ function around the knee is to help bend the knee, which assists to unlock the knee from a perfectly straight knee position. There are two distinct portions of the gastrocnemius muscle; which are termed the medial and lateral heads. In a well-defined calf, these two heads can easily be seen from behind as the subject rises up onto their toes. The medial head extends farther down the calf than the lateral head. The second muscle making up the calf is the soleus muscle. This muscle is a long, flat muscle that lies behind the gastrocnemius muscle, and directly along the back of the shin (tibia) bone. The soleus muscle has a common attachment with the gastrocnemius muscle to the back of the heel (Achilles tendon.) It does not cross over the knee joint but rather attaches simply to the back of the shinbone and the back of the bone on the outside of the lower leg, called the fibula. Together the two heads of the gastrocnemius muscle along with the soleus muscle are collectively referred to as the triceps surae. The soleus muscle functions in conjunction with the gastrocnemius muscle to plantar flex your foot. When the knee is bent, the gastrocnemius is biomechanically at a disadvantage so it is the soleus muscle that is the main muscle to perform the plantar-flexion action. For instance, when you sit in a car and press the gas or brake pedals it is the soleus muscle hardest at work. In addition to plantar-flexing the foot, one of the other most important functions of the soleus muscle is to help us with our daily upright posture by resisting us from swaying too much in the forward direction; if the soleus muscle wasn’t constantly at work, we would fall over! Together the muscles of the triceps surae work particularly hard when walking. When the heel strikes the ground these muscles work to decelerate the lower leg and resist it from moving too far forward. As the step progresses, these muscles work to plantar-flex the foot and get it ready to propel forward for the next step. The final muscle in the back of the calf is called the plantaris muscle. It is a very small, thin, rope-like muscle, which is located more to the outside of the calf area. This muscle crosses over both the knee and ankle and also attaches into the Achilles tendon. This muscle works in conjunction with the gastrocnemius and the soleus to plantar-flex the foot. What causes a calf strain? Although strains can occur in any of the three calf muscles, they most often occur in the large gastrocnemius muscle due to its size and the fact that it crosses two joints (the knee and the ankle). More specifically, it is the medial head of the gastrocnemius that most often sustains a muscle strain. The next most common strain is to the soleus, and then to the plantaris muscle. A calf strain often occurs when the calf muscles are working eccentrically (working while under a stretch), such as coming down from a jump, and also during the time when you are about to push off to jump again. Most often the strain occurs at the musculotendinous junction of one of the muscles (where the muscle attaches to its tendon) but it can occur anywhere along the muscle belly as well. As we age, the tissues of the body lose some of their elasticity, including the muscles and tendons. For this reason, strains, including calf strains, are more common in the active middle-aged patient. In addition to the tissue changes, often these people are ‘weekend warriors’ who do little to keep their muscles flexible and strong throughout the week but aggressively do sport on the weekend, which also puts them at greater risk. How are calf strains classified? Grade I (mild): Very few muscle fibers have been injured. Pain may not be felt until the following day after the instigating activity. Strength and range of motion of the calf remains full but pain can often be felt on testing when the calf muscle is at its end range of stretching. No swelling or bruising is noted. Grade II (moderate): A large category including all strains between grades I and grade III. Being that this category is so large, it is sometimes further divided into having a mild, moderate or severe grade II strain. With this category many muscle fibers are torn, which results in a decrease in plantar-flexion strength and often a limited range of motion going into the other direction (pulling the foot upwards, or dorsi-flexion) and when stretching the calf. Some muscle fibers remain uninjured and intact. Pain is present both when stretching the calf and on muscle strength testing. Swelling and bruising may be noted. Grade III (severe): All fibers of the calf muscle are completely torn. This means that the muscle is completely torn into two parts or the muscle belly has torn from its attachment to the tendon. Severe swelling, pain, and bruising accompany a grade III strain. There is generally limited ability to generate any force on strength testing of plantar-flexion due to the tear, however the other uninjured calf muscles may compensate to initiate some strength. Range of motion is severely limited due to pain. What does a calf strain feel like? How do health care professionals diagnose the problem? Your Physical Therapist at Purposed Physical Therapy will ask a number of questions to determine if you have strained your calf and to determine how severe the damage is. They will want to know exactly where your pain is, precisely when you injured yourself, and if you injured your calf from one specific event or if a repetitive injury caused your pain. They will ask if you felt or heard a pop when the injury occurred, what you felt immediately after the injury, and whether or not you feel that you have lost any strength or range of motion. Your therapist will also want to know if there has been any swelling or bruising around the area or anywhere down into your ankle or foot. They will also want to know what sort of things are aggravating your pain such as walking, running or jumping and if you have been able to do anything to make your pain feel better. They will inquire about any medications you are taking and whether or not you have ever injured your calf in the past. After a thorough history your Physical Therapist will do a physical examination. They will examine the area to determine if there is any swelling or bruising present and will palpate (feel) your calf to find out which area is most sore. Your therapist will also check to see if there are any divots or unusual bumps in the calf area, which are usually the result of a section of torn muscle fibers and would indicate a more severe strain. They will also closely exam the appearance of your Achilles tendon and how it moves as you (or they) contract or squeeze your muscle. It is important to rule out tearing of the Achilles tendon, which can appear very similar to a calf strain in the initial stages. Your therapist will ask you to contract your muscle and move your knee and ankle joints in order to determine how much range of motion you have and whether or not moving your foot causes calf pain. In order to help determine the severity of the strain your Physical Therapist will also assess how much they can passively stretch your calf muscle, and will check how much strength you can generate with your muscle. They may ask you to push down with your foot against resistance, or may ask you to try to rise up on your toes or jump in order to help assess the severity of your strain. Lastly, they will check the integrity of both your knee and ankle joints to ensure that you haven’t also injured them when you hurt yourself. After a thorough history and physical examination your Physical Therapist will determine whether you have indeed suffered a calf strain, and will grade the severity of your strain. If they determine that your strain is severe (a severe grade II or a grade III) they may send you to your physician for a review as further investigations may be required in order to determine more specifically where the strain is, and how severe it is. Medication may also be needed to help control some of your symptoms. If you have a severe strain you may require the use of crutches in order to get around; your Physical Therapist can teach you how to use them. The general rule regarding when to use crutches after a calf strain is such that if you are limping when walking without crutches, you should use crutches. Crutches (or a cane/stick) should continue to be used until your strain heals enough so that you are able to walk without limping when not using the walking aid. What will my doctor do when I see them? In the case of a severe calf strain (severe grade II or a grade III), a physician’s review may be necessary. When you see your physician, they may prescribe anti-inflammatory or pain medications to help control the swelling and assist with your pain. Your physician will determine if a diagnostic investigation is required to further assess your calf strain or help rule out an Achilles tendon rupture. In cases of severe calf strains, an ultrasound or a magnetic imaging resonance (MRI) test may be ordered to confirm which calf muscle has been injured, to determine the exact amount of damage to the muscle, and to rule out an Achilles tendon rupture. An ultrasound has the benefit of allowing the patient to move into different positions while viewing the muscle. An MRI has the benefit of giving more detailed information and can more confidently confirm the severity of the muscle strain. This type of imaging is important only if surgery is being considered to restore the integrity of the muscle or tendon. Grade I or grade II strains that are mild to moderate do not generally require any investigative reviews but may benefit from the use of pain or anti-inflammatory medications. The initial approach to Physical Therapy of your calf strain will depend on how long after your injury that you seek treatment. The immediate line of defense straight after sustaining a calf strain should be the application of ice and compression, followed by rest and elevation. Recent research on the benefits of applying ice immediately after an injury are beginning to be questioned as it can halt the much-needed inflammatory response, but the general consensus is still to apply ice. Applying compression as a first line of defense is extremely important. This is generally done by wrapping the affected area. Recent evidence supports the critical role of compression in preventing secondary tissue damage. The initial aim of treatment for acute calf strains at Purposed Physical Therapy is to decrease the pain as well as any secondary inflammation in the area. Some initial inflammation is required to start the healing process, but a large inflammatory response can also lead to secondary inflammation and secondary cell injury, which affects tissues that were not directly related to the initial insult. Ice and compression can greatly assist in decreasing this detrimental secondary tissue injury. Being that the swelling from a calf injury often ends up in the ankle or foot due to gravity pulling it downwards, elevating the ankle while there is still swelling can greatly assist in moving excess tissue fluid back towards your heart and out of your limb. In cases where you are not dealing with an acute strain, heat may be more useful in decreasing pain. Your Physical Therapist can advise you whether it is best to use ice or heat at your stage of healing. In the early phase your therapist may also use electrical modalities such as ultrasound or interferential current to help decrease the pain and control the amount of inflammation. Again, in the initial healing stages all anti-inflammatory attempts are aimed at controlling too much inflammation from occurring, rather than completely eliminating it. Inflammation that remains after the initial phases of healing, however, is undesired, so by this stage of healing, the aim is to finally eliminate any remaining swelling. Massage of the injured area or the tissues surrounding the area may be helpful in both decreasing swelling and decreasing pain. Depending on the severity of the strain and the time that has elapsed since the injury, massage directly over the torn calf muscle can slow the healing process and may lead to other muscle complications so be sure to heed your Physical Therapist’s advice on whether or not this is something you should be doing on your own. As indicated above, medication to ease the pain or inflammation can often be very beneficial in the overall treatment of a calf strain. Depending on the degree of your strain and stage of healing, your Physical Therapist may suggest you see your doctor to discuss the use of anti-inflammatory or pain-relieving medications in conjunction with your Physical Therapy treatment. Your Physical Therapist may even liaise directly with your doctor to obtain their advice on the use of medication in your individual case. Once the initial pain and inflammation has calmed down, your Physical Therapist will focus on improving the range of motion and strength of your calf. Static stretches to increase the movement of your calf muscle will be prescribed by your Physical Therapist early on in your treatment. These types of stretches encourage the healing tissues to withstand stretch and they ensure that you do not lose any range of motion. As your range of motion improves, more aggressive stretches will be added, however stretching should be limited such that it never causes pain. Feeling a gentle stretch at the end of the range of motion should be the limit otherwise further damage could occur to the calf muscle. As the muscle advances in the healing process, dynamic stretching (rapid motions that stretch the tissues quickly) will also be taught and will be incorporated into your rehabilitation exercise routine in order to prepare your calf to return to more taxing movements such as prolonged walking, stair climbing, and jumping. Dynamic stretches are used to prepare the tissues for activity whereas static stretches focus more on gaining flexibility. Rest is also an important part of your Physical Therapy treatment. ‘Relative rest’ is a term used to describe a scale of resting compared to the normal activity you would be doing. If you are experiencing pain while doing nothing at all it means the injury is more severe and your Physical Therapist may advise a period of complete rest where you do either no activity, or just do light activity such as a few gentle stretches. As your pain improves then the rest to activity balance will swing the other way such that you will still require more rest for the calf than usual, but there will also be a gradual increase in activity including more aggressive stretches along with strengthening as long as there is no return in symptoms. Along with stretching exercises, your Physical Therapist will also prescribe strengthening exercises in order to get your calf back in top shape. Initially your therapist may suggest that you only do isometric contractions of your muscle, which means that you tighten the affected muscle without actually moving the associated joints. An example of this type of contraction may be sitting with your foot flat against a wall, and pushing into the wall without actually moving your ankle. This type of contraction is an effective way to begin strengthening your calf. As the muscle continues to heal, more aggressive strengthening will be prescribed where you are raising up onto your toes with part or all of your body weight. When appropriate your therapist will prescribe strengthening exercises with free weights, elastic bands or tubing, weight machines, or cardiovascular machines such as stationary bicycles or a treadmill in order to continue to increase the strength and endurance in your calf. As your calf is more fully healed, your therapist will add eccentric type strengthening to your rehabilitation program. Eccentric exercises are ones that put load through your muscle as it is lengthening. These types of exercises are necessary as part of your rehabilitation program in order to prepare your calf for the return to normal everyday activity and sport. Lowering yourself off the end of a step or landing from jumping are examples of eccentric exercises for your calf. Quite often it is an eccentric contraction of the muscle that has caused the calf strain in the first place, so training the muscle (when the time is right) to withstand this type of force is crucial to ensuring it won’t be re-injured. Plyometrics is a form of power strengthening that is a particularly important part of the end stage of your rehabilitation for a calf strain, especially if you are involved in sport. Plyometrics involves repetitive jumping which forces your calf muscle to engage in force as it repetitively shortens and lengthens. This type of training maximally loads the calf muscle. In addition to stretching and strengthening the muscle, taping, wrapping or using a soft support/brace on the calf may be suggested by your Physical Therapist in order to assist initial swelling, and to provide support to the muscle as you rehabilitate it. They may even teach you how to tape or wrap your own muscle so you can do it on your own. A critical part of our treatment for a calf strain at Purposed Physical Therapy includes advice on finally returning to your full normal physical activity level. A calf strain can easily be aggravated if too much stress is put through it at an inappropriate time. Calf strains can easily be re-aggravated. Returning to your normal physical activity at a graduated pace is key in avoiding a repetitive calf strain. Advice from your Physical Therapist on the acceptable level of activity at each stage of your rehabilitation process will be invaluable, and will assist you in returning to your activities as quickly but as safely as possible. Most cases of calf strains heal well with Physical Therapy treatment although in some rare cases calf strains may require surgical intervention. In most cases this is due to a severe Grade II or a Grade III strain where all or nearly all of the muscle fibers have been torn and surgery is necessary to re-attach the injured muscle fibers. A surgical option is most often considered when conservative (non-surgical) interventions have failed, and it is generally done on active individuals who have not been able to return to their regular activity level due to ongoing calf pain. Surgical intervention will require immobilization in a cast or plastic boot for a period of time after the surgery in order to let the muscle fibers heal. Your surgeon will advise you as to when it is safe to put weight on your surgical side. You will require Physical Therapy after the surgery to assist you in reducing any pain from the surgery, as well as regaining your calf and ankle range of motion, strength, and endurance. As the calf heals, your therapist will assist you in safely returning to your regular activities. What kinds of complications can occur from a calf strain? In rare cases a complication may result as a calf strain heals. Incurring a complication is more common when dealing with a severe than mild strain. Factors that may affect the risk of developing a complication include stretching the muscle too aggressively and too early on, not having an appropriate time to heal before returning to activity, or massaging directly over the strain too aggressively. The most common complication with a calf strain is a re-injury which most often results from returning to activity too soon before the tear is healed. In order to ensure you don’t do too much too soon, strictly follow the advice of your Physical Therapist in regards to your stretching, strengthening, and return to everyday and sporting activity. In more severe calf strains, hematomas (blood clots) can develop as a complication within the healing muscle. The hematoma is felt as a hard lump in the muscle fairly early on in the recovery process. The development of a hematoma can delay recovery time, but the hematoma, in most cases, will eventually be reabsorbed back into the tissue, and a full recovery will be made. With some calf strains myositis ossificans (MO) may develop. This condition occurs most often in strains of the quadriceps muscle but can occur in any strained muscle, including the calf. In this condition bone-like deposits form in damaged muscle fibers (a process called ossification) but the exact mechanism of this conversion remains unclear. MO will also cause a lump in the healing tissue, similar to a hematoma, but the calcification of the muscle will not be felt or show up on X-ray usually any earlier than approximately 4 weeks after the injury, which distinguishes it from a hematoma. Being too aggressive in early rehabilitation or returning to activity too early may be related to developing MO. See Purposed Physical Therapy’s Guide to Myositis Ossificans. Another rare complication of a severe calf strain can be a compartment syndrome. When a severe strain occurs there is a lot of local swelling and blood in the area, which has nowhere to escape to. The force of the extra fluid in the area can put pressure on the other local muscles and arteries and can cause severe damage or death to the muscles by cutting off their blood supply. Symptoms of a compartment syndrome occurring after a calf strain include a sudden, new and excessive pain or ache in the injured area, pins and needles or tingling, difficulty moving the body part, and tightness on palpation of the area. An acute compartment syndrome requires immediate medical attention in order to decompress the compartment, restore blood supply to the tissues, and ensure no muscle death occurs in the affected area. A severe calf strain may also result in another rare, but serious, complication call rhabdomyolysis. In this condition muscle fibers rapidly die off and muscle protein and enzymes are then released into the blood stream and out in the urine. Due to the muscle protein and enzymes traveling in the blood stream, rhabdomyolysis can cause symptoms related to not just the local muscle, but also the entire functioning of the body including kidney problems. The condition of rhabdomyolysis can also be caused by other injuries than a muscle strain. Rhabdomyolysis may be difficult to diagnose but can cause symptoms such as ongoing muscle pain, weakness and stiffness, as well as darkened urine. Rhabdomyolysis itself can be the cause of a compartment syndrome in the area. If rhabdomyolysis is suspected, a blood and urine test will be required to confirm the diagnosis. Treatment of rhabdomyolysis can be complicated and will depend on the severity of the condition as well as the initial cause of it. Calf strains involve a tear to the fibers of one of the calf muscles and vary in healing time depending on how severe the strain is. If you experience a calf strain, let the expert Physical Therapists at Purposed Physical Therapy assist you in determining the severity of your strain as well as help get you back to your everyday activity or sport by guiding you through the appropriate rehabilitation program.